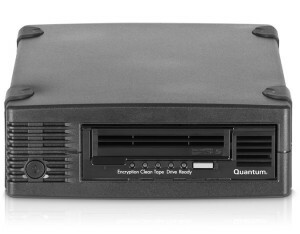 Quantum’s LTO-5 tape drive delivers tremendous capacity and performance at an affordable price. In addition, it uses less power on average than LTO-4 drives, making it a “greener” and more energy efficient solution. Quantum’s LTO-5 Half-Height tape drive is a midrange tape drive with enterprise-class features and reliability providing capacity of up to 3TB (2:1 compressed) on a single cartridge and transfer rates of up to 280MB/s (2:1 compressed), all at an affordable price. The features of the LTO-5 HH tape drive include native 256-AES encryption, WORM capability, and a new partitioning functionality that enables “tape aware” file searches. This new partitioning feature addresses the growing needs of marketplace segments such as rich media. Quantum’s LTO-5 tape drives also protects customers’ investments by providing backward read and write compatibility with LTO-4 media and backward read compatibility with LTO-3 media. The drives are offered in high-speed 6Gb/s SAS interfaces, along with SAS HBA bundle options. Quantum’s exclusive FastSense variable-speed feature has been improved for LTO-5 tape drives. The FastSense feature monitors the speed of incoming data and matches the speed at which the drive streams data more effectively than the competitors’ LTO drives. The bottom line is that Quantum’s LTO-5 tape drives complete backups faster and use less power than many competitors’ drives. LTO-5 HH tape drives will be available in server-installable internal, tabletop & Rackmount configurations.